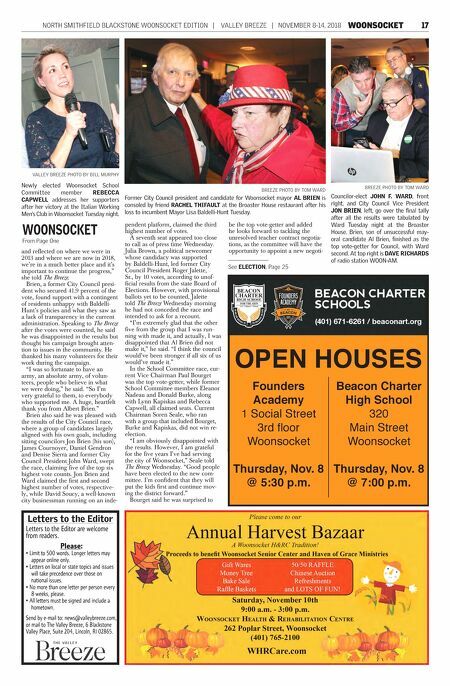 NORTH SMITHFIELD BLACKSTONE WOONSOCKET EDITION | VALLEY BREEZE | NOVEMBER 8-14, 2018 WOONSOCKET 17 and reflected on where we were in 2013 and where we are now in 2018, we're in a much better place and it's important to continue the progress," she told The Breeze. Brien, a former City Council presi- dent who secured 41.9 percent of the vote, found support with a contingent of residents unhappy with Baldelli- Hunt's policies and what they saw as a lack of transparency in the current administration. Speaking to The Breeze after the votes were counted, he said he was disappointed in the results but thought his campaign brought atten- tion to issues in the community. He thanked his many volunteers for their work during the campaign. "I was so fortunate to have an army, an absolute army, of volun- teers, people who believe in what we were doing," he said. "So I'm very grateful to them, to everybody who supported me. A huge, heartfelt thank you from Albert Brien." Brien also said he was pleased with the results of the City Council race, where a group of candidates largely aligned with his own goals, including sitting councilors Jon Brien (his son), James Cournoyer, Daniel Gendron and Denise Sierra and former City Council President John Ward, swept the race, claiming five of the top six highest vote counts. Jon Brien and Ward claimed the first and second highest number of votes, respective- ly, while David Soucy, a well-known city businessman running on an inde- pendent platform, claimed the third highest number of votes. A seventh seat appeared too close to call as of press time Wednesday. Julia Brown, a political newcomer whose candidacy was supported by Baldelli-Hunt, led former City Council President Roger Jalette, Sr., by 10 votes, according to unof- ficial results from the state Board of Elections. However, with provisional ballots yet to be counted, Jalette told The Breeze Wednesday morning he had not conceded the race and intended to ask for a recount. "I'm extremely glad that the other five from the group that I was run- ning with made it, and actually, I was disappointed that Al Brien did not make it," he said. "I think the council would've been stronger if all six of us would've made it." In the School Committee race, cur- rent Vice Chairman Paul Bourget was the top vote-getter, while former School Committee members Eleanor Nadeau and Donald Burke, along with Lynn Kapiskas and Rebecca Capwell, all claimed seats. Current Chairman Soren Seale, who ran with a group that included Bourget, Burke and Kapiskas, did not win re- election. "I am obviously disappointed with the results. However, I am grateful for the five years I've had serving the city of Woonsocket," Seale told The Breeze Wednesday. "Good people have been elected to the new com- mittee. I'm confident that they will put the kids first and continue mov- ing the district forward." Bourget said he was surprised to be the top vote-getter and added he looks forward to tackling the unresolved teacher contract negotia- tions, as the committee will have the opportunity to appoint a new negoti- BREEZE PHOTO BY TOM WARD Councilor-elect JOHN F. WARD, front right, and City Council Vice President JON BRIEN, left, go over the final tally after all the results were tabulated by Ward Tuesday night at the Broaster House. Brien, son of unsuccessful may- oral candidate Al Brien, finished as the top vote-getter for Council, with Ward second. At top right is DAVE RICHARDS of radio station WOON-AM. BREEZE PHOTO BY TOM WARD Former City Council president and candidate for Woonsocket mayor AL BRIEN is consoled by friend RACHEL THIFAULT at the Broaster House restaurant after his loss to incumbent Mayor Lisa Baldelli-Hunt Tuesday. VALLEY BREEZE PHOTO BY BILL MURPHY Newly elected Woonsocket School Committee member REBECCA CAPWELL addresses her supporters after her victory at the Italian Working Men's Club in Woonsocket Tuesday night. 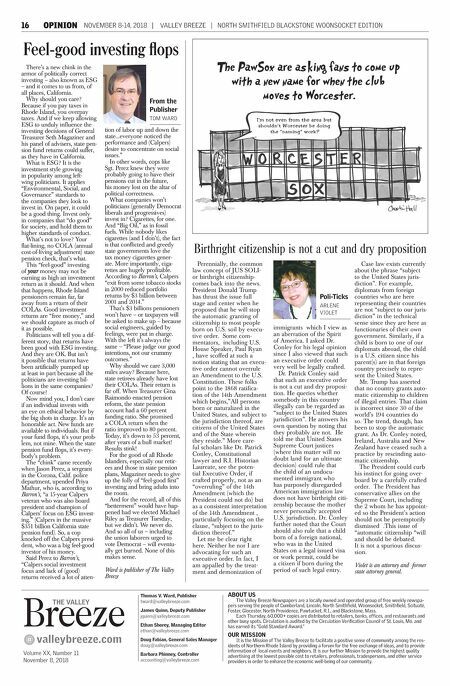 WOONSOCKET From Page One See ELECTION, Page 25 Letters to the Editor Letters to the Editor are welcome from readers. Please: • Limit to 500 words. Longer letters may appear online only. • Letters on local or state topics and issues will take precedence over those on national issues. • No more than one letter per person every 8 weeks, please. • All letters must be signed and include a hometown. Send by e-mail to: news@valleybreeze.com, or mail to The Valley Breeze, 6 Blackstone Valley Place, Suite 204, Lincoln, RI 02865. OPEN HOUSES Founders Academy 1 Social Street 3rd floor Woonsocket Thursday, Nov. 8 @ 5:30 p.m. Beacon Charter High School 320 Main Street Woonsocket Thursday, Nov. 8 @ 7:00 p.m.